The Hiatus is officially over!!! This is the cover of the March/April edition of Phenomenal Woman magazine. 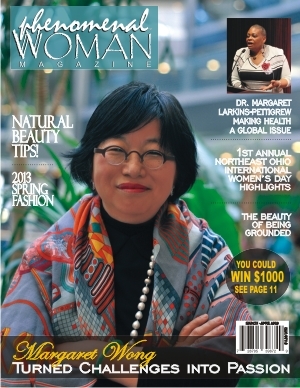 I am pleased to say I captured the photo of Margaret Wong that graces the cover. We are just shy of 100 days into the New Year and this space has been neglected beyond belief. The hopes of a better start to a 365 Photo Project – gone! A new twist on the “Five on Friday” – unfulfilled! So how do I feel about this? Well I’m disappointed, but this time around I won’t beat myself up because I’ve been writing. I’ve been shooting, unfortunately I haven’t been blogging. I’ve missed this arena and I’m committed to fitting it into everything else I’m doing. The key is scheduling and preparation and I am working on that now. The photo above is my explanation of what has kept me away. I believe I have shared with you the launch of Phenomenal Woman Magazine a bi-monthly women’s magazine for which I have the privilege of serving as Managing Editor. That undertaking as well as my full-time job have kept me busy and away from this space. The magazine has really been a hit with our readers, and we were even successful in obtaining a national advertisement! I hope this post peaks your curiosity and that you’ll come back regularly. In the weeks to come I’ll share some scenes from around North Collinwood as well as share some of the wonderful art I’m waiting to receive as part of the annual Liberate Your Art – Postcard Swap. Thanks for stopping by and I look forward to hearing your comments. Author shelleyshockleyPosted on April 8, 2013 Categories UncategorizedTags Cover Photo, Hiatus, Margaret Wong, Phenomenal WomanLeave a comment on The Hiatus is officially over!! !